The Long Femoral Leg Simulator was designed by a senior vascular surgeon in Spain who has been involved in vascular simulation training for over 10 years with the SimuVasc organization in Europe. The Long Femoral Leg Simulator is an extension of the Femoral Leg Simulator, offering an opening at the Groin. It was designed to allow for Tunneling skills training in addition to all Femo Pop vascular skills training. 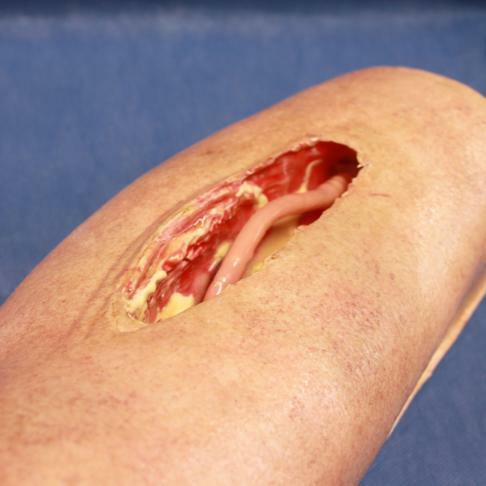 Realistic human leg with three openings that allow two trainees to train simultaneously and practice the usage of all vascular instruments to access, clamp, cut vessels. Pulsatile pump is available and useful to evaluate the quality of the repair. The Long Femoral Leg Simulator includes a male size leg with three openings where the Medium Femoral Artery (groin opening) and the Small Femoral Artery (above and below knee openings) can be placed. The Leg is available with or without a pulsatile pump to check the quality of the repair. This vascular simulator contains latex. Femoral Leg Simulator 1 kg 54 cm x 20 cm x 14 cm. Manufacturer -LifeLike BioTissue, Items 1252, 1267. Price: $2,520.00 (without pump) $3,060.75 (with pump).